Derrick Rose Wins NBA MVP, But Was He The Most Deserving? 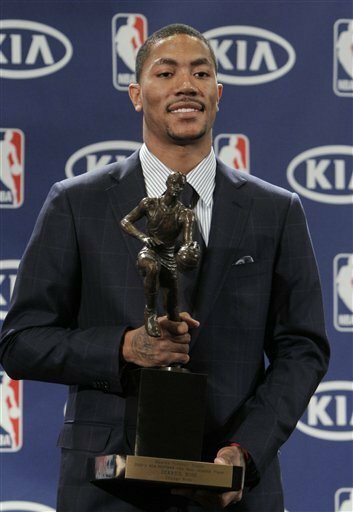 Derrick Rose was named the Most Valuable Player of the 2010-11 NBA Season as he led the Bulls to the top seed in the Eastern Conference and the best record in all of the NBA. Rose is the youngest recipient of the MVP award at the ripe old age of 22. He averaged 25.0 points, 7.7 assists and 4.1 rebounds over the course of the season. There is no doubt that Rose had a superb season but was he the most deserving player? If there was one person I would have chosen as the NBA MVP besides Rose, it would have been Dwight Howard. Howard has seemingly always been the best defender in the paint but this year he really developed into a dominant presence on the offensive end this year. People place too much important at performance at the end of games and some will make the argument that Howard was not very noticeable offensively late in games but he did lead the league in rebounds per minute during the last 45 seconds of a game and is near the top in blocks. And you have to give him credit because he had the worst supporting cast of any of the top five finishers in the voting, as proving in the opening round series against Atlanta where Howard played terrifically but nobody else showed up and that's why they lost. Another player I would have considered it was LeBron James. Yes he did play with those two stars in D-Wade and Chris Bosh but he still had one of his best seasons of his career. He did lead the NBA in Player Efficiency Rating. But the reason why I would not vote for him was because of his tremendous supporting cast and the fact that Dwayne Wade was terrific this year as well. You can make a strong case for both Howard and James, but if I had a vote I would have voted for Rose. He broke out this season as the best point guard in the NBA and carried his team to a new level when he had too, particularly in the opening round against Indiana.